That the Lord avert and downsize storms that threaten life and the way of life. That He bring compassion to these areas that need recovery. Bless those first responders and officials that have acted wisely. Continued prayer for the total rebuilding of Puerto Rico and the Virgin Islands. Recovery in TX and FL. For those affected by the floods in Bangladesh, India and Nepal have killed 1200 people and affected 16 million others. There are few safety networks or resources. For the Rohingya Muslims as they flee through mountains…a 3 day treck…from Myanmar to Bangladesh because of injustice…they have no legal papers and are not welcomed in Bangladesh….many diseases plague them. For the violence in the US and around the world. There have been 272 incidents of shooting in 2017 in the US. This is more than 1 day in Afghanistan. For the healing of those injured in Las Vegas, healing for their broken hearts because of major life changes, healing for those who have lost loved ones. That those in remote areas with few or no health clinics will receive immunizations which prevent disabilities…like polio. That new laws will be enacted which will improve health around the world. For Terry’s pending knee surgery to repair a torn meniscus. For stirring the hearts of those to give funds to those affected by the recent tragic weather events. That Dave is feeling better and walking 2 miles and empowering the doctors to diagnosis the problem. That You have received Ed into your arms and his suffering is over. The Lord that Saudi Arabian women will be able to drive starting in June 2018. That an Ethiopian government official promised Dr. Katherine Hamlin that her hospitals would no longer be used to surgically repair obstetrical fistulas…but rather will be used as neonatal units…by 2020. That means that recent laws against early marriage and marital abductions are beginning to take effect. Dr. Hamlin’s hospitals, 5 in Ethiopia and others in several countries, have given women dignity and the ability to return to home. That more girls are able to enter schools and be educated. While there is still much work to be done around the world, progress is being made. We praise the Lord that about 100 Nigerian girls were returned from Baka Haram and are now in school after a year of counseling. We give our gratitude to the Lord, Jesus Christ for giving each of us a home in America. We are proud to be Americans. The character of those who have fought, and the many who have given their lives for our freedoms exhibit character that challenges the rest of us, are such models to our children. The police, first responders and military honor our country, our flag and us. For citizens who love and serve during times of crises and first responders who sacrifice their lives for the rest of us and for the police and military who expose themselves to death to save us in storms and terror. If you would like to join our group of Intercessors, please email Terry@gtininc.org. . . .4because we have heard of your faith in Christ Jesus and of the love you have for all God’s people- 5the faith and love that spring from the hope stored up for you in heaven and about which you have already heard in the true message of the gospel. Lord, we ask you to direct hurricane Maria to prevent death and destruction…as you reduced it with Irma. For the victims of the floods in Bangladesh, India and Nepal that have killed 1,200 people and affected 16 million others. For those affected by the 8.5 earthquake in Mexico. For the protection those vulnerable persons: those living with disability, the elderly and small children; those needing justice and those being trafficked during a time where these people are especially vulnerable and predators find a safe time to do their evil. For those living in the hinterlands of developing countries…that they will receive immunizations which prevent disabilities like polio. For two dear friends entering hospice this week. . . for emotional and physical comfort; their sense of the Lord’s Presence and a deep relationship with Him as they feel HIS loving embrace. For low death rates in FL and TX. For the community working on clean up. FEMA and other state and federal workers. For the first responders’ dedication and character to step in and up. For Your Spirit to prevail developing gifts and opportunities for us to become more like You, Jesus: your character, cooperation, kindness and love for all; building community and fellowship. One way they do this is by partnering with local organizations in Honduras. Karen Spring, the HSN Program Coordinator, organizes educational delegations to Honduras to accompany and assist communities in this struggle. On a delegation earlier this year, participants traveled with copies of Donde no hay doctor and Donde no hay doctor para mujeres to bring to grassroots organizations throughout the country. The delegates’ impact was even greater because they were able to leave these important health resources behind after their trip. One group, the Siria Valle Environmental Committee, works with people sickened by open pit gold mining, pervasive in the region and backed by US and Canadian interests. Committee member Olga Velasquez is a self-taught promotora who talks to her neighbors about health concerns, accompanies them on the hour-long bus ride to the hospital, and makes sure they are following through on treatment plans. When people come to see Olga, she consults Hesperian books, and always takes them with her on health visits. Karen also delivered books to COPINH — the Civic Council of Indigenous and Popular Organizations. 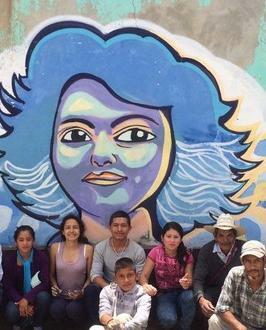 COPINH was founded by the late Berta Cáceres, winner of the Goldman Environmental Prize, who was murdered for protecting her land from corporate mining interests. Members of the organization use Donde no hay doctor and Donde no hay doctor para mujeres in promotora trainings with Lenca indigenous women, and distribute photocopies to the participants. OFRANEH, a Black Fraternal Organization, also received copies of the books. 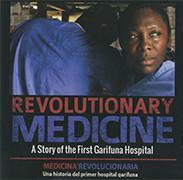 The Garifuna (afro-Honduran) people they work with live over two hours from the nearest hospital, and struggle with high rates of malaria, dengue fever, diabetes and hypertension. In this remote part of the country, Donde no hay doctor and Donde no hay doctor para mujeres are truly lifesaving resources. The next time you travel, bring Hesperian books with you to have a lasting impact on the communities you visit. Learn more about ways to share these resources on your travels with our free travel handout, available along with our new Traveler’s Set, in English and Spanish. Save when you buy Hesperian books together to take on your travels. 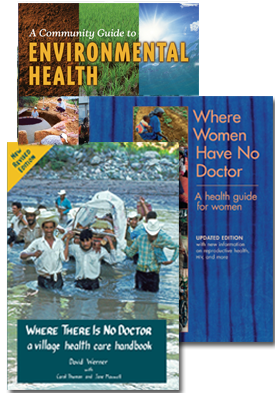 Our new Traveler’s Set, available in English and Spanish, offers Where There Is No Doctor, Where Women Have No Doctor and A Community Guide to Environmental Health at a 20% discount. And through the end of August, Hesperian is offering an additional 10% off! Don’t miss this chance for even bigger savings. Use promo code“4YourTravels” at checkout to save. Watch the story of how the Garifuna people on the Atlantic Coast of Honduras are resisting the privatization of healthcare. This engaging film depicts the community’s struggle to defend their land and their health by building their own free, holistic hospital run on solar power. Hesperian is proud to support the important work of community organizations in Honduras. 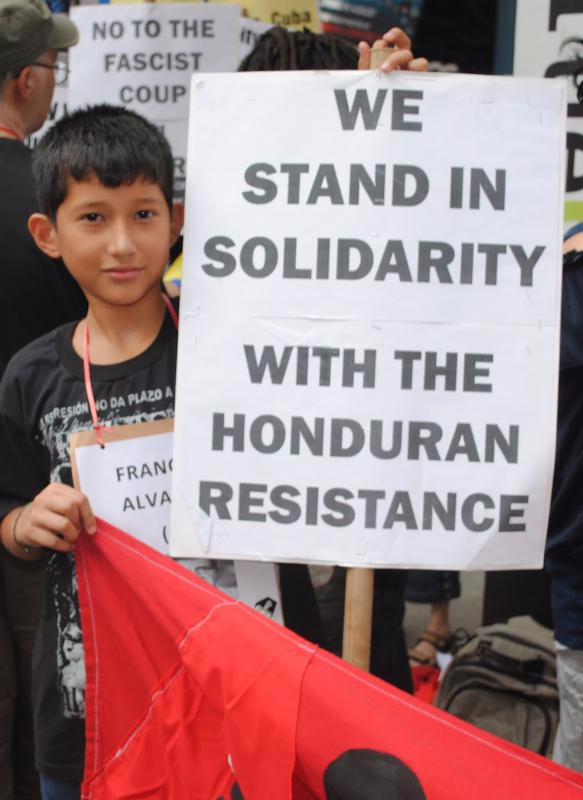 Learn more about the Honduras Solidarity Network and their local partners, COPINH, and OFRANEH, and find out more about the health and social problems caused by gold mining in the Siria Valle. Quiere recibir noticias en español? Haga clic aqui. Hesperian is a nonprofit organization committed to providing clear, up-to-date health information to people worldwide. Please help us continue our work by making a donation or by buying directly from us. If we offer it again in 2012 you will receive notification through our blog posts and website. Ethiopians celebrate New Year’s Day in September each year and are 7 years behind the western calendar as they use the Gregorian calendar. All of the women in each family will be up all night preparing for the Christmas day feast. Typically, each family buys a sheep, if they can afford it, kills it and cooks it in various dishes and stews. Here is a glimpse of other traditional Ethiopian Christmas customs. *A Christmas scene including a manger scene that includes the Three Magi. Legend has it that the king bearing frankincense was King Balthazar of Ethiopia. *Families will attend a local Christian Orthodox service. All will sing carols and carry candles either during or after the service. *After church an Ethiopian feast is enjoyed of foods like doro wat (a spicy chicken stew), injera bread (flat round bread), Ambasha (huge round celebration bread) and homemade drinks. *A game of Ganna or Leddat, field hockey, is enjoyed by the children separating into two opposing teams. The stick and ball are made from locally grown trees. In Ethiopia, the teams often represent certain regions. According to tradition, shepherds celebrated when they heard of Jesus birth by playing such a game. Pray for Ethiopians as they celebrate that the true meaning of Christs appearance will be known and experienced in new and fresh ways. This is happening because of your financial gifts and prayers and our travel and training in the field. When those master trainers (nationals) we’ve trained go deeper into the bush/down country to train other village nationals, volunteer CHEs (Community Health Evangelists), this training team becomes the 2nd generation disability training team. The 2nd generation CHEs use the lessons on disability in their homes and then train their churches and neighbors. They become the 3rd generation disability training CHE’s!! PRAY neighboring villages and tribes ask them for the same training…multiplying to 4th and 5th generations of wholistic laborers. It is probably already happening, but 16-25 hours out of Addis Abba, Ethiopia’s capitol, now by foot, with no phones or computers, it is difficult to track Gods messages and laborers. Jesus has trained all of His followers to be multipliers. Multipliers work horizontally within a village and vertically deeper and deeper into a nation. We call this generational multiplication. We all are called to both horizontal and vertical multiplication; both are necessary and so exciting…so GTN is pleased with the progress so far. Thank you each: the national trainers in the field, intercessors, gifts to cover the trainings, those writing disability lessons, and organizers. It takes a whole team. *We use the word “wholistic” (instead of “holistic”) to denote training for the whole person: spiritual, physical, emotional and social. *In 6 months, our team (of Ethiopians and an American–1st generation) trained 21 national master trainers (2nd generation) who trained 156 national CHEs (3rd generation) in 72 villages who trained their churches and neighbors. It’s gone viral!! *In the past year, we trained 3 times in West Africa. From those groups Dayo, from Nigeria, gave a vision seminar on disability in Senegal! Heartbeat for Africa (Americans) also attended: This spring June and Greg will give disability trainings in Liberia and Sierra Leone! Greg has been asked to give it in Peru! 2nd generation trainers! *A pastor confessed and repented before his congregation for his lack of Biblical understanding and his exclusion and neglect of people with disability. *A district denomination office hired a 15-year-old Downs gal; she is the primary wage earner in her family. *”We believe those with seizures are witches and stone them to death. Now we know the disease and must tell our villages,” reported one trainee in Nigeria. *Kids and families are being embraced by the church and community. Slowly the disabled, in community with disability training, are no longer hidden and isolated. They are going to school and church. Some are being employed. PRAY for more and more to hear the good news, change attitudes and transform communities. Just as we are celebrating HIS birth at this time of year, people are experiencing a new birth of attitudes and behavior; those with disability are experiencing love and acceptance and a new way of life…truly an unexpected new birth for them. Globally, people with disability represent the largest unreached people group. PRAY they will be sought out and embraced…and be told that the Savior loves them, too…and experience spiritual birth. We invite you to make a comment or start a dialogue.